Recently, Oak City Technology was approached by The RTP Foundation and The Frontier building to participate in a community workshop program. When asked what we thought would be the most beneficial content we could provide small business owners, startups and nonprofits we immediately knew we had to teach how Google’s algorithm actually works. This class will cover the basics on how Google actually applies their ranking system to search results, and a few easy ways you can improve your standing with Google on a local level. 5 – How To Improve! The goal of this is to class is to accurately show the methods that Google employs to rank websites on a local level while explaining the information in an easy to understand format. Below will be the actual slides followed a bit more in-depth discussion on them. Let’s dive in! This is the act by which Google follows links on all over the internet to identify pages that exist. This is most likely the origination of Google finding your content, website or even social media today. For the more technical people out there, this is also where Google applies disavow or nofollow rules. This how Google and other search engines turn your website into a form of data that it can store and use for computing (search algorithm) purposes. 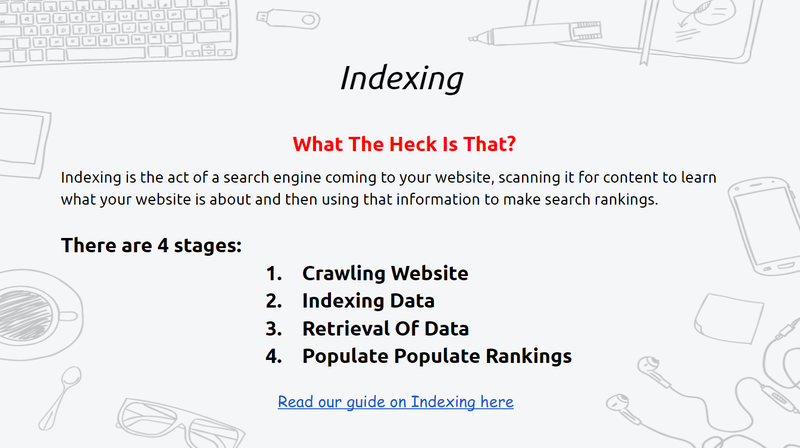 Indexing is basically taking a snapshot of your website while doing a lot of cool yet complicated things at the same time. The pure complexity of what goes on in this process is hard to describe in a short blog post. Personally, we at Oak City find this to be one of the most fascinating and dynamic aspects of the internet today. Step 1 of 2 when you enter something into a search bar on Google. This is where the actual algorithm computing process starts its work through the Google’s servers. When you enter a search, the first thing that happens is Google populates the ALL the data that may be relevant to your search across the WHOLE internet based on the specific words or keywords you entered. Now we move to step 2 of 2 where ALL that search data is ranked by relevance to what Google thinks you are actually looking for. It applies a wide range of variables to be able to produce accurate data to you including, location, search history and keywords. Oh did we mention that both of these steps happen IN LESS THAN A SECOND?!? We may geek out over the power, complexity and speed of what Google has created, but this is truly revolutionary. Keywords: This is basically the context of the entire website. These tell google who you are and what you do. If Google can’t determine this in an efficient manner, your rankings will suffer. Large portion of what On-Site SEO entails. Here is a very long guide on how to improve On-Site SEO. Links: Links used to be the single highest ranking factor. Not the case anymore today but still important. Links come from things like other blogs, news article and even social media posts. Yes, social media posts are factored into this but are not weighted as highly as links from say a local news website like WRAL. Page Load Speed: Recently, Google announced that page load times are a full ranking factor as part of their mobile first algorithm changes. Very complex. Site Structure: This is basically how easy is your website for a user to use. Do your menu tabs have pages people want or need? How many clicks does it take to contact you? Mobile Compatibility: Responsive design is the standard for websites today, Google says they want it this way, we listen. Scales to screen size. Extremely important for SEO today. 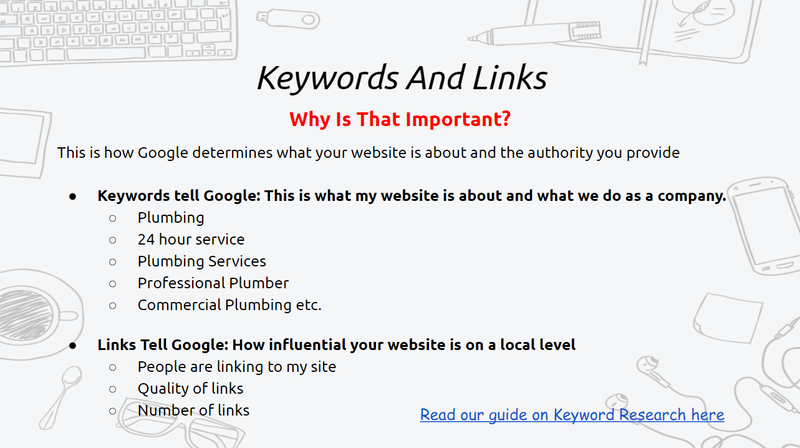 Local Keywords On Site: People want to know where you are, what you do. 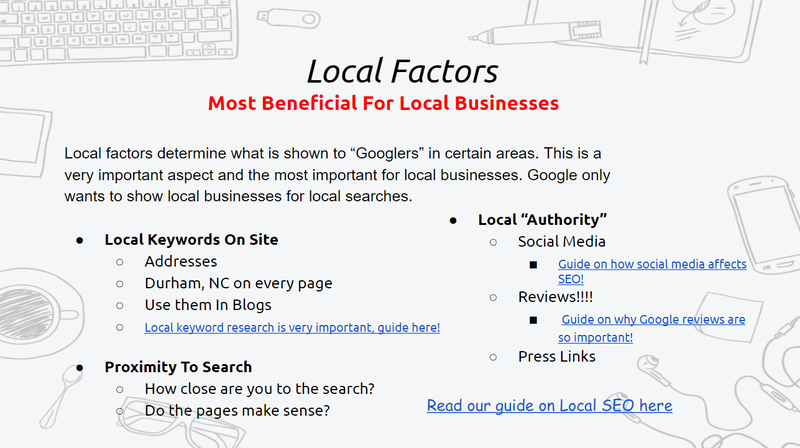 Local keyword research is very important, guide here! Proximity to Search: When people search for things on a local level, they DO NOT want results for a plumber in another state. People naturally want to use services close to home and that service should be yours. Google maps has full integration ABCD list map, that all comes from Google My Business! Local Authority: You need to be active on social media. Here is a guide on how social media affects SEO! Google reviews are also a huge part of local rankings, people care about how other people rank things, especially local business, the more LEGIT reviews you can get the better. Guide on why Google reviews are so important! #5 How Can I Improve? Write More Blogs: Today, local websites need to produce content regularly to stay relevant to Google to a large extent. The best way to do this is write more blog on your website that answer questions people have about your company or industry. Do new clients ALWAYS ask the same few questions. Answer them in a blog to show relevance to Google in that you are trying to provide value to the local Google ecosystem. Google My Business: I can not stress enough how important Google My Business Pages are. Here is a guide on Google My Business and SEO. 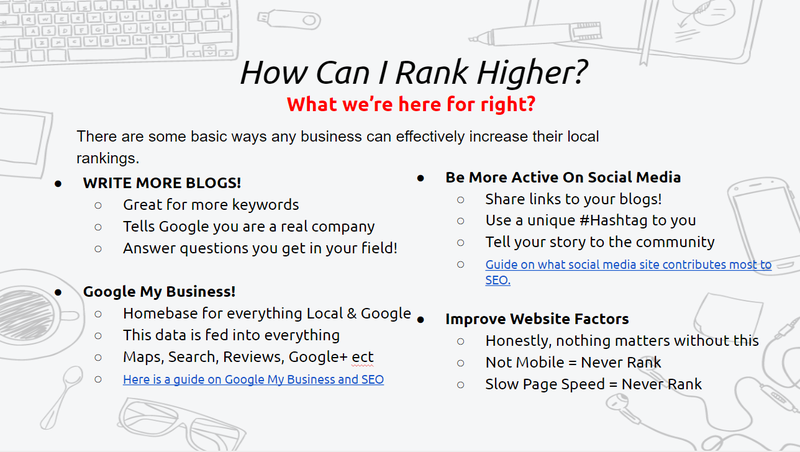 This guide is explaining in great detail why these pages are, and you can improve yours. Social Media: Responsive design is the standard for websites today, Google says they want it this way, we listen. Scales to screen size. Extremely important for SEO today. Guide on what social media site contributes most to SEO. 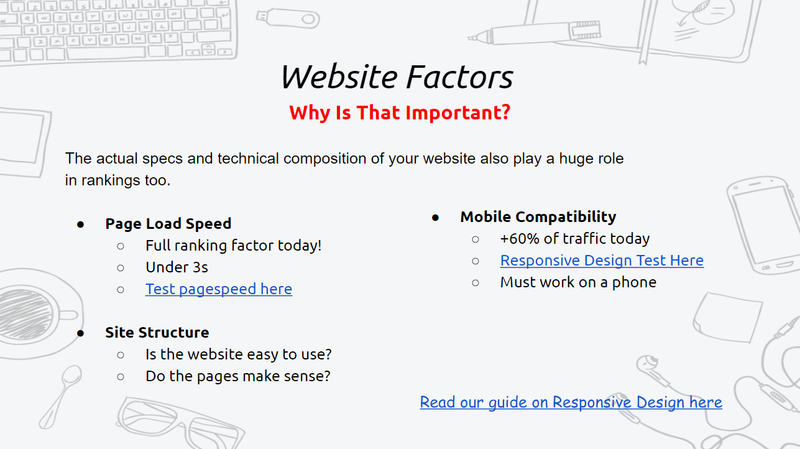 Improve Website factors: As stated above, this is something that requires the most attention in the beginning. Without a well functioning, easy to use website that is responsive, fast and user friendly, you could put days into social media and blogging without seeing a result. The technical aspects of your website are the base that all SEO is built on, take it seriously. Guide on the relationship between Social media and Google Search results.